On Thursday, August 2, Dairy Queen in Albany held a special event in order to raise money for the Monroe Carell Jr. Children’s Hospital at Vanderbilt in Tennessee. Dairy Queen owner Patrick Padron said his store has always donated to the Children’s Miracle Network charity, but he said this is the first year they have made it into an all day event. Padron said for every Blizzard sold on Thursday, one dollar will be donated to the children’s hospital. After the day was all said and done, Padron said $1,011.16 was raised for the children’s hospital. The event started around 11 a.m. and was over at the close of business on Thursday. Padron was extremely excited about the event and its success for the first year. For the past month, Dairy Queen has been selling balloons to help raise money for the cause as well and had raised about $600 thus far. Regardless of being a small town, Clinton County historically has come together to support many events over the years. Padron was extremely pleased with how Thursday turned out for the children and the amount of money he was able to raise for such a good cause. This type of fundraising is not just a Clinton County thing, Padron said all the stores across the country were helping raise money for a charity. Padron said this was the first year so many different things have been going on at once for this cause. Dairy Queen owners Lindsey and Patrick Padron were handing out Blizzards Thursday to help raise money for the Monroe Carell Jr. Children’s Hospital at Vanderbilt. 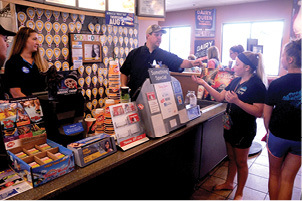 Dairy Queen raised $1,011.16 for the charity.